What Is A Branch Mint? Exempt From Capital Gains Tax? This is our blog, if you are interested in purchasing sovereigns or half sovereigns from the mints mentioned please click the links below. Although The Royal Mint in London is the main mint for the production of the British sovereign, since 1871 these gold coins have been struck at other branch mints. The Royal Mint was required to produce British sovereigns, for the United Kingdom as well as the rest of the British Empire which used the sovereign as part of their everyday coinage. This popular gold coin had a nominal value of 20 shillings and was the one pound coin of its time. When gold was discovered in Australia in 1851, The Royal Mint realised that it made good economic sense to mint the gold sovereigns in Australia. The costs involved with shipping the gold to England, producing the sovereigns in London and then transporting the coins back to Australia for circulation were expensive. Insurance was difficult to procure and it often took more than six months from shipping the gold to London to return as sovereigns to Australia. 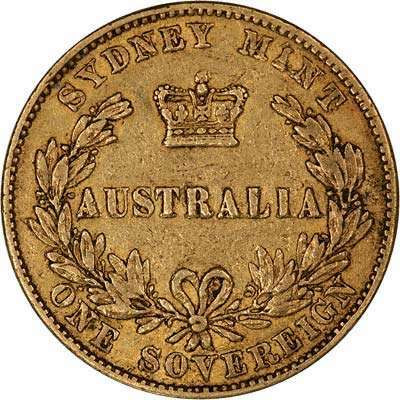 Sydney, Australia became the first branch mint of The Royal Mint to strike sovereigns. Close to where the gold was being mined, Sydney in New South Wales had agreed to pay the costs of building a mint and the subsequent running costs to produce the sovereigns. To differentiate between sovereigns struck in England and the Sydney mint, it was agreed that the Australian sovereigns would feature a new reverse design. This was probably so that if anything went wrong with the new venture, The Royal Mint would be able to disassociate itself from the Australian branch mint. However, the venture was successful and in 1855 the Sydney mint started producing sovereigns and half-sovereigns for circulation. 1855 Victoria Sovereign Reverse - Struck at the Sydney mint branch featuring the Sydney Mint Australian reverse. In 1857, a new portrait of Queen Victoria appeared on sovereigns produced by the Sydney mint. Designed by Leonard Charles Wyon, this portrait was only used on the Australian sovereigns. Similar to his father, William Wyon's Young Head portrait, the bust continued to show a youthful Queen wearing her hair loosely braided and a laureate. The Sydney mint issued its last gold sovereign in 1926. A total of 116,704,050 sovereigns were struck at the Sydney mint. The Victoria colony in Australia had petitioned The Royal Mint for the right to strike sovereigns. 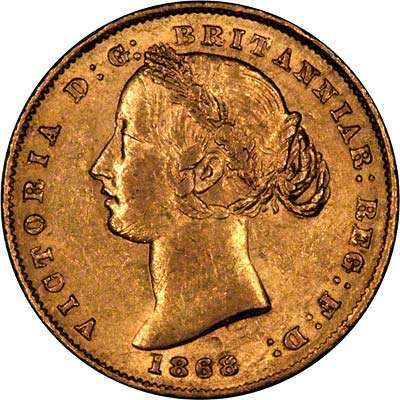 Although it had lost to Sydney, huge amounts of gold continued to be mined and it was decided in 1872 that another Australian branch mint should be opened in Melbourne. 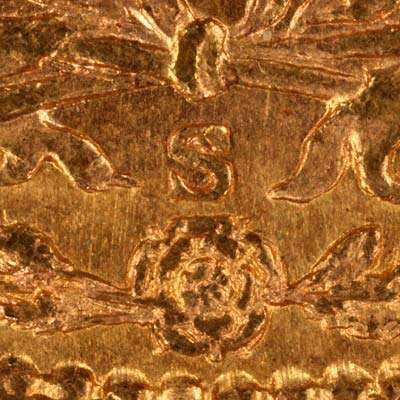 Following the success and quality of the Sydney mint sovereigns, it was agreed that both the Sydney mint and the Melbourne mint would be allowed to produce sovereigns bearing the same obverse and reverse designs as The Royal Mint in London. To differentiate the mints, a mint mark would be added to the Australian sovereigns, S for Sydney and M for Melbourne. The Melbourne mint struck its last sovereign in 1931. A total of 148,211,120 sovereigns were struck in Melbourne. The demand for gold sovereigns continued to grow as did the success of Queen Victoria's British Empire. It was not long before another Australian branch mint opened in Perth. The gold rush had continued across Australia to Western Australia. Between 1869 and 1900 the population grew from 23,000 to 180,000. In 1899, the Perth mint opened and started producing sovereigns for Australia and other countries of the Empire.The mint mark for Perth is a P.
Between 1899 and 1931, the Perth mint struck over 106 million sovereigns and 730,000 half sovereigns - over 27 million ounces of gold. The Ottawa mint is also known as the Canada mint. It was the only mint in Canada to produce sovereigns using gold mined in the Yukon and British Columbia. This branch mint was opened in 1908 and struck sovereign coins for ten years, between 1908 to 1919 (they did not produce sovereigns in 1912). Many sovereigns were sent to the Canadian mint to be melted down into gold bars to pay Britain's war debt in the First World War. The mint mark for the Ottawa mint is a C for Canada. The Ottawa mint became the Royal Canadian Mint in 1931. Canada mint sovereigns tend to be sought after by collectors, with some years achieving particularly high prices. Only 628,152 sovereigns in total were struck at the Ottawa mint. The Bombay mint in India was opened in 1918. Although the Bombay mint struck sovereigns for only one year, they produced almost 1.3 million (1,294,372) 1918 George V Sovereigns, more than the Canadian Mint produced in a decade. 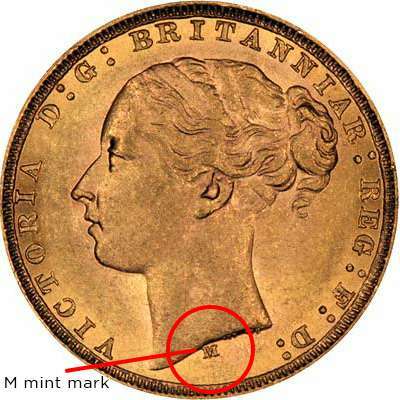 The mint mark for the Bombay mint is an I which is located in the ground above the year date on the reverse of the sovereign. In 2013, The Royal Mint issued a licence to MMTC-PAMP to produce commemorative sovereigns in India. These sovereigns were to be only sold to the Indian market but we have seen them for sale in the UK. After the Boer War, the British occupied South Africa and British currency became the legal tender circulation coinage. The Royal Mint opened a branch in Pretoria, South Africa and in 1923, the first sovereign was issued there. Although sovereigns were not used for circulation in Great Britain at this point, they were still used overseas and were popular investment coins all over the world. Only 423 sovereigns were struck by the Pretoria mint in 1923 making this a highly sought after coin. The last sovereign was struck by the South African mint in 1932. 83,442,397 sovereigns were struck in Pretoria between 1923 and 1932. In 1941, the branch cut ties with The Royal Mint and became the South African Mint which produces circulation coins and proof Krugerrands today. * From 1976 sovereigns have been struck at the Royal Mint's Llantrisant branch in Wales. 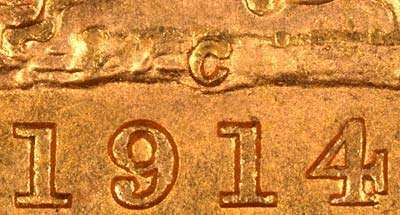 Many coin collectors can find the mint mark difficult to find at first. The photos below will assist you to locate them. You may find it useful to use a loupe or a magnifying glass to look at your coin. On Victoria Young Head sovereigns with shield reverse, the mint marks are found on the reverse below the bow of the wreath but above the rose. 1883 Victoria Young Head Sovereign with shield reverse - S mint mark for Sydney is located on the reverse, under the shield and wreath bow, above the rose. 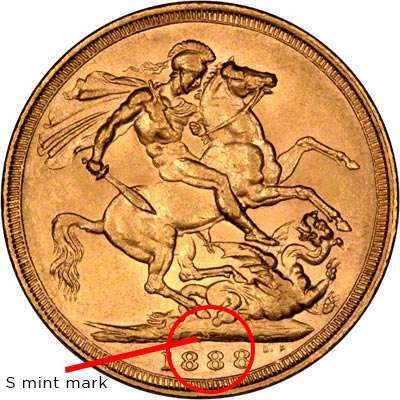 For the Victoria Young Head sovereigns with the St George and the dragon reverse, the mint mark appears on the obverse under the head. 1879 Victoria Young Head sovereign with St George reverse - the M mint mark for Melbourne is found on the obverse under the truncated neck. In 1887, three different sovereigns were issued: the Victoria Young Head shield reverse (mint marks are located on the reverse below the shield and bow), the Victoria Young Head (mint marks are located on the obverse under the truncation) and the Victoria Jubilee Head (mint marks are found on the reverse in the ground above the date). Sovereigns issued between 1888 to 1932 that have been struck by one of the overseas branch mints all have the mint mark on the reverse in the ground above the year date. 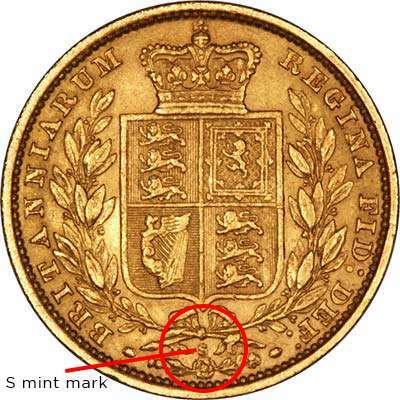 If no mint mark is present, this indicates that the sovereign was issued by The Royal Mint in London. Yes, they are! Sovereigns and half sovereigns are all British legal tender and are exempt from Capital Gains Tax. It doesn't matter whether they were struck in London or abroad. They are classed as Investment Gold by HMRC so the are also VAT free. If you are interested in collecting a mint mark type collection contact us on 01253 343081 or by email at info@chards.co.uk for more details.